Leading off the set of four Akira Kurosawa classics is Seven Samurai (1954), unanimously hailed as one of the greatest masterpieces in the history of the motion picture. It was the inspiration for countless films modeled after its basic premise, but has never been surpassed in terms of sheer power of emotion, kinetic energy, and dynamic character development. 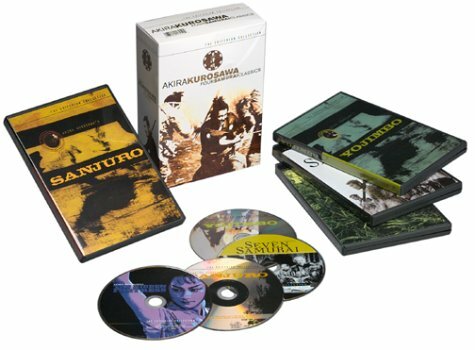 The story is set in the 1600s, when the residents of a small Japanese village seek protection against repeated attacks by a band of marauding thieves and hire seven unemployed "ronin" (masterless samurai), including a boastful swordsman (Toshiro Mifune), who is actually a farmer's son desperately seeking glory and acceptance. The climactic battle remains one of the most breathtaking sequences ever filmed and one of Kurosawa's crowning cinematic achievements. In another of the many Kurosawa-Mifune collaborations, The Hidden Fortress (1958) tells the story of a warrior and a princess trying against all odds to return to their homeland with their fortune. Along the way, they are simultaneously assisted and thwarted by two itinerant and not-too-bright farmers with their own designs on the treasure. Frequently cited for its thematic influences on Star Wars, The Hidden Fortress combines an epic tale of struggle and honor with modern comic sensibilities. The partly comic Yojimbo (1961) was inspired by the American Western genre. Mifune plays a drifting samurai for hire who plays both ends against the middle with two warring factions, surviving on his wits and his ability to outrun his own bad luck. Yojimbo is striking for its unorthodox treatment of violence and morality, reserving judgment on the actions of its main character and instead presenting an entertaining tale with humor and much visual excitement. One of the inspirations for the spaghetti Westerns of director Sergio Leone and the 1996 Bruce Willis vehicle Last Man Standing, this film offers insight into a director who influenced American films even as he was influenced by them. The 1963 sequel, Sanjuro, is more lighthearted and less cynical, a rousing adventure with Mifune becoming an unlikely big brother to a troupe of nine naive samurai. It isn't the subtlest of Kurosawa's films, but it's one of his most entertaining. If you have any questions about this product by Criterion, contact us by completing and submitting the form below. If you are looking for a specif part number, please include it with your message.